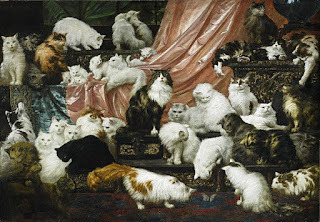 Atlas Obscura 13 May 2016: "In the 1860s, the cats of England were suffering from a major image problem. Having experienced the highs of Ancient Egyptian veneration and the lows of medieval torture on account of their supposed allegiance with the devil, cats were regarded by the average Victorian as scruffy, mewling rat-catchers who weren't welcome in well-appointed rooms. Then came one man who, with his unabashed adoration of his feline friends, shook up the cat world for good: Harrison Weir, organizer of England's first cat show. Before Weir united cats and aristocrats, kitties were considered street animals. Cats provided a useful service—rodent extermination—but were not generally valued for their cuteness, cuddliness, or companionship. Charles Darwin lamented their "nocturnal rambling..." read on.